So for the past year or so I have been trying to rally support to go run this run. However several of my friends had done it once before and said that was enough. Other friends just didn’t want to make the drive out there for a 3.5 mile run. So when Tupper suggested running this late Friday afternoon before heading to Cherry Creek for the weekend, I was in. 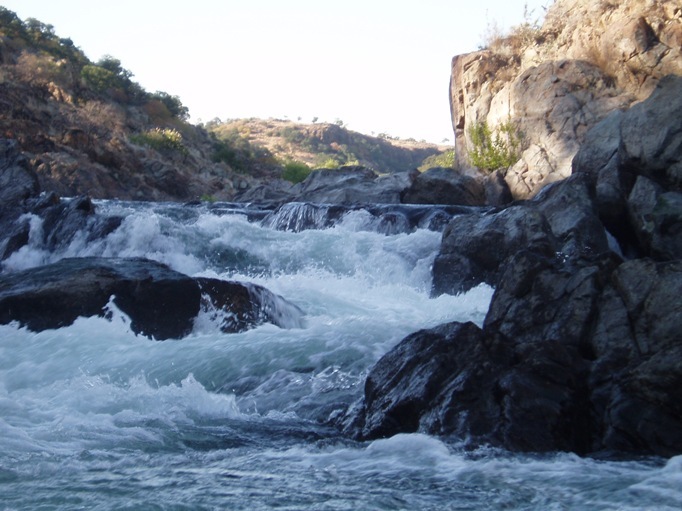 The flow had been holding steady for many months, either at 1,400 or 1,200 cfs. A flow which I thought would be perfect. I checked the flow before I left the house and sure enough the flow was the same, so we headed out. 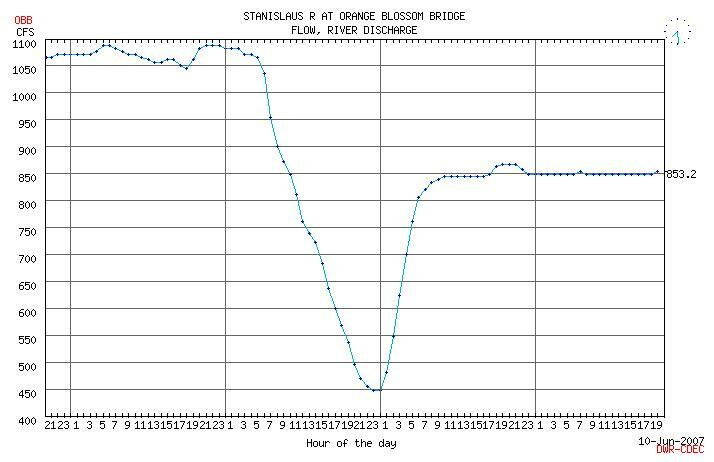 To our surprise and confusion, the flow was much lower than that, on the order of 450 cfs. At this flow the river was still fun, however not the same river at all. Mr. Toad’s Wild Ride was very rocky, there was a line down it, but it involved hitting many rocks, and that was the clean, if all goes right, line. However the portage around it is awful. At our low flow we were able to do a partial portage around the rockiest of it, but then ferrying out direction into a hole in front of the undercut. To portage the whole thing you have to go all the way around a huge rock outcropping which will take 30-40 minutes I guess. 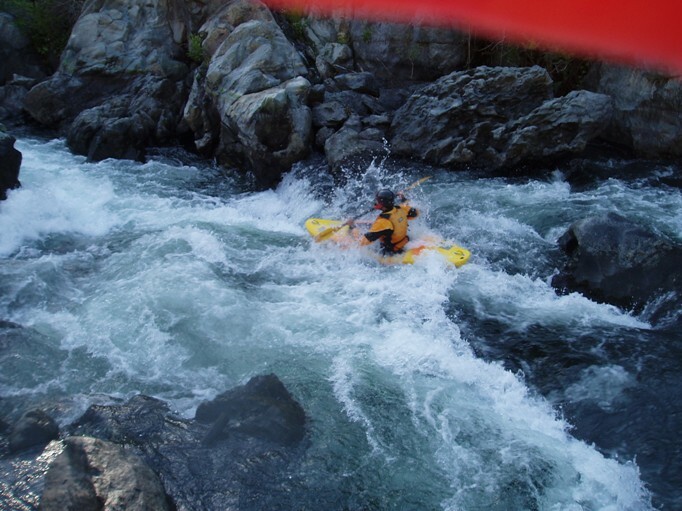 If the flow is low, or if you think you might not want to run this rapid, put in Matterhorn. 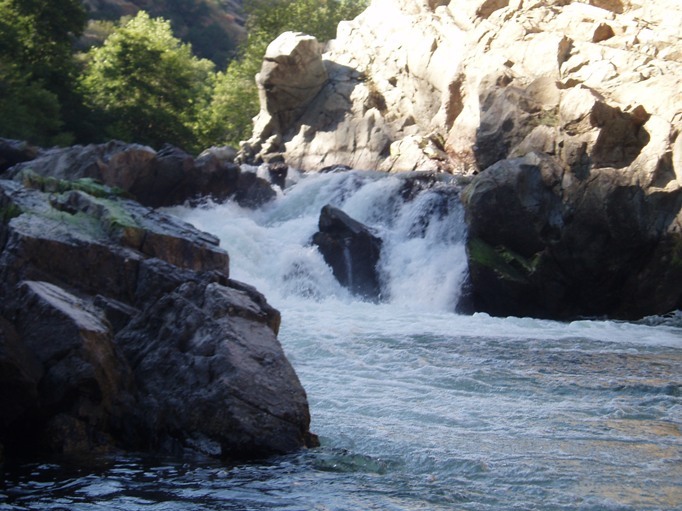 So at 450-500, the river was entertaining but hardly worth driving from Sacramento for. With more water I think it would be better. 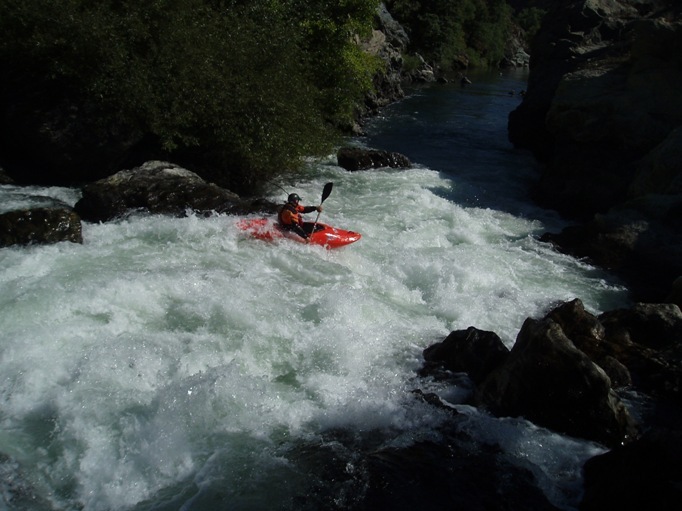 Either way, it is a great thing to boat if passing by going to Yosemite or the T.
Personally, if it is low, I will not put in at the top again as there are no other good rapids in there. And if it is high, I will put in at the top again and hope Mr. Toads looks better. Mr. Toad’s Wild Ride (IV+). 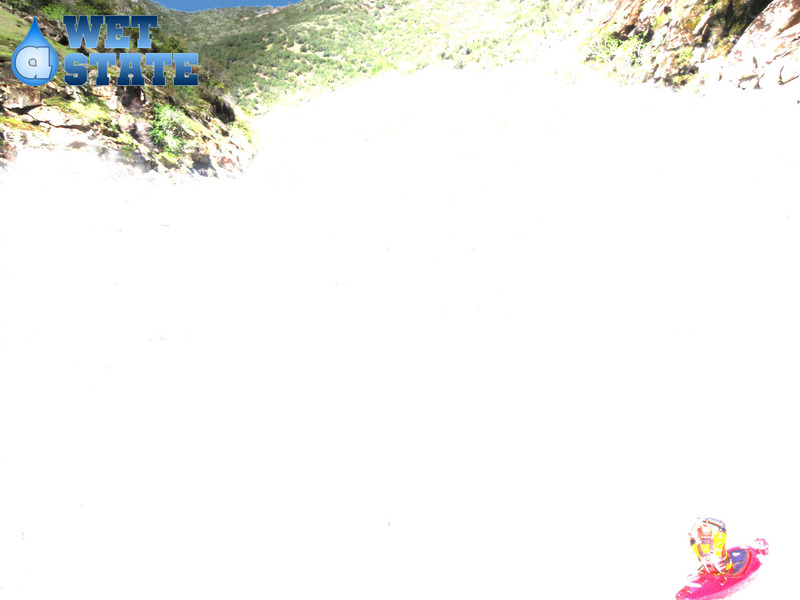 A very junky rapid leads down into a hole which is backed up on the right by an undercut wall. The left side is a death trap of sieves which has already claimed one life. You can also scout this from the road. There is a bluff which overhangs the drop with a trail leading the 30 feet out to it. Surf City (II+). Normally there is a great play wave in the one rapid between the big drops. Matterhorn (V-VI). At the low flow it is totally unrunnable. Apparently with a couple grand it becomes more straightforward. There are just so many rocks in there to break body parts on. No thanks. After Matterhorn it is calm for about a half mile. 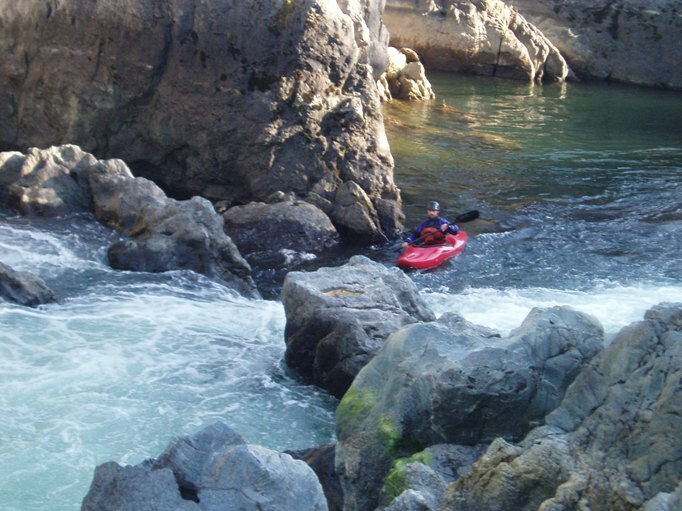 Then the river drops into a little gorge and the fun begins. Small Entrance (II+). 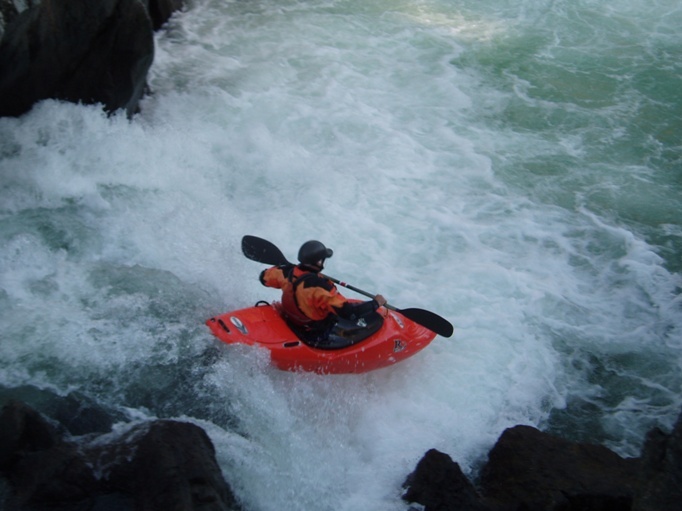 A small rapid drops you obviously into a bit of a granite gorge. Upper Pin Ball (III-). Pick a line. Lower Pin Ball (III-). Just get right of the mid-river rock. Haunted House (IV-V). At low flows this rapid is pretty easy. Drive to the right side of the drop and boof. The left side goes into a nasty pocket or hole. At higher flows a room of doom comes into play on the river left. If done correctly, you can just scout through the seams of the holes and then paddle away from the room of doom. Sluices (III-). 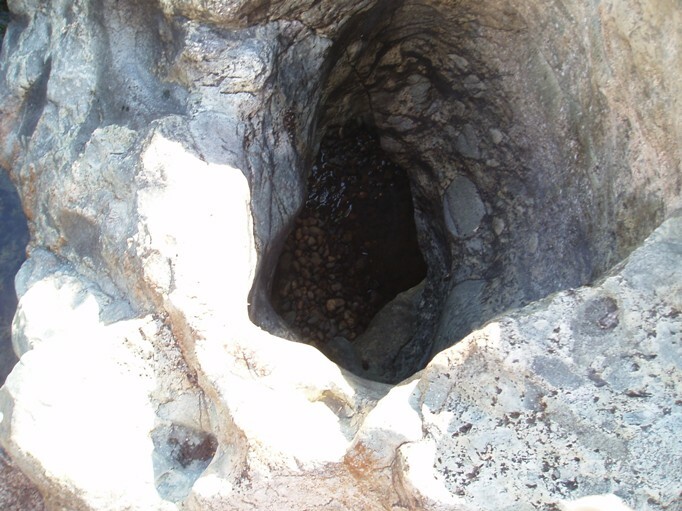 A neat rock formation creates a little sluice area. We entered right and cut across one of the sluices to finish left. Air Mattress (IV). This is the last big rapid on the run. 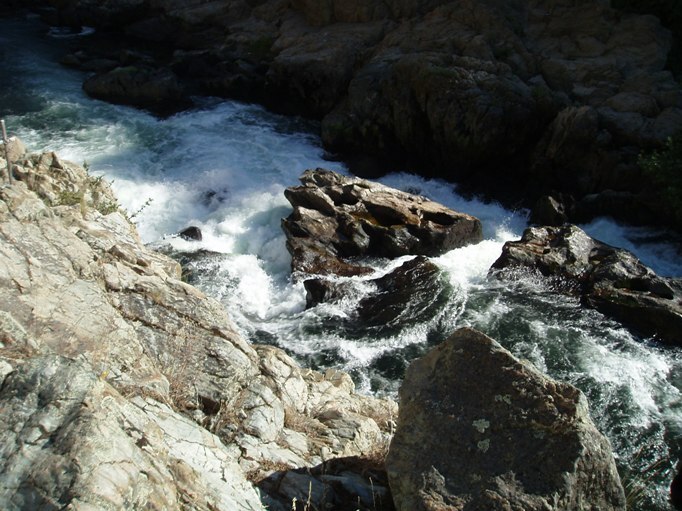 The rapids starts in a narrow chute and drops over a drop into a fairly large but forgiving hole. It back endered one boat, but they flush out immediately. From their pick a channel around the rocks right behind the drop. 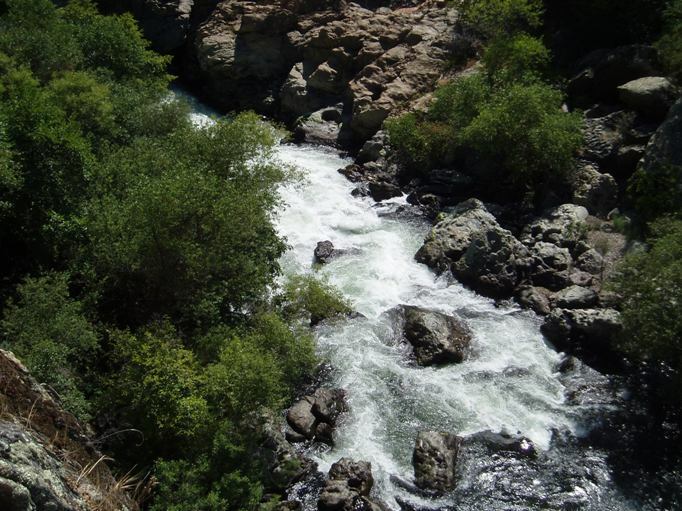 Take out: From 5, drive on Highway 120 to Knights Ferry Historical site. Turn left on Kennedy Road and drive a short ways. Turn left on Sonora Road. Follow down to the bridge, cross and park in the parking on the right. From the East it is Sonora road exit you take. Put in: Get back on 120 East, and drive a few miles. When you see the sign for “Tulloch Lake, N. Shore 15 miles,” turn left, drop down and cross the other side of the freeway. 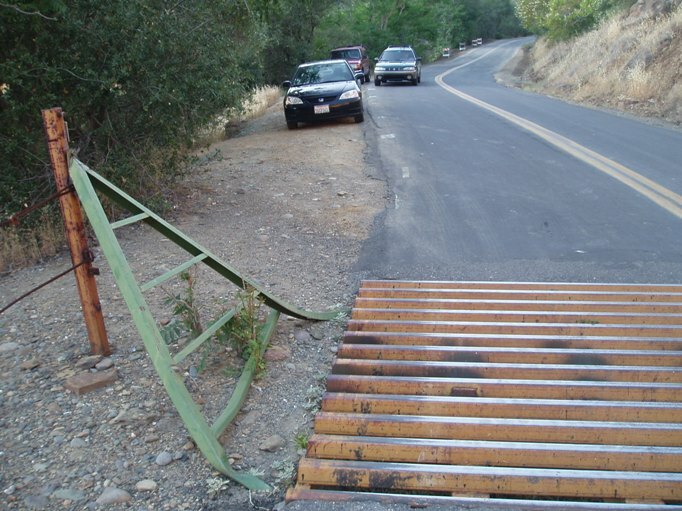 Continue on this road until you cross a cattle guard and see a bathroom on your left, the narrow parking in on the left shoulder. Below is a entertaining story and photos sent in by Greg Schimdt along with some higher water beta. Thanks for the contribution. So here's the story behind the photos in Goodwin Canyon's Haunted House's Room of Doom. 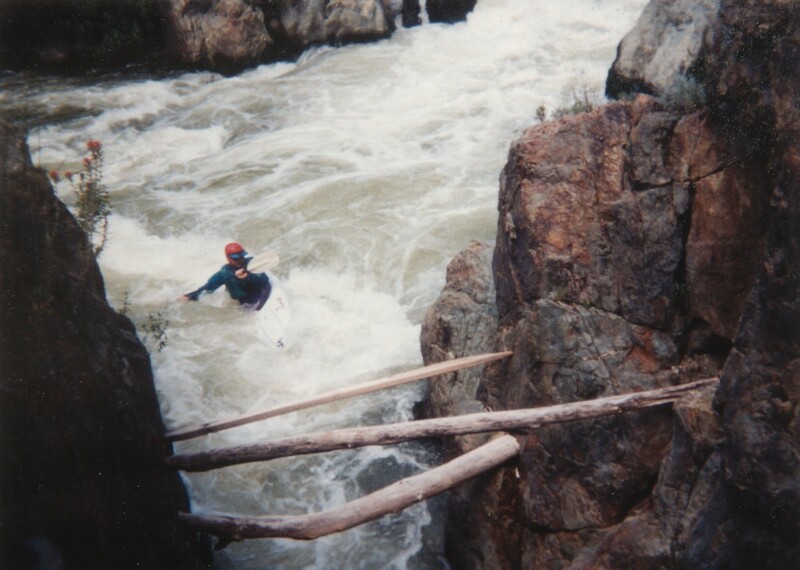 It was May 7th, 1995 and I was kayaking in my Pirouette with a Sunshine River Adventures commercial raft trip. 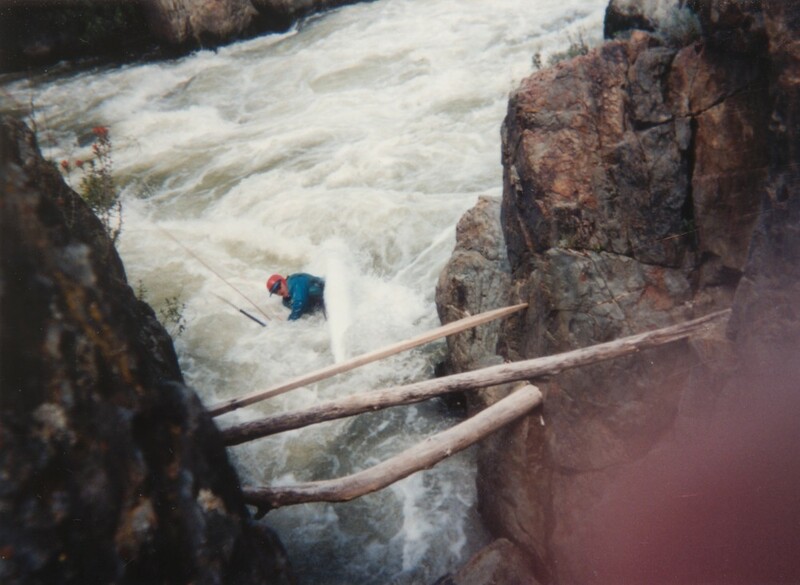 We had a high flow (I think it was 1,600 cfs) and I was a bit nervous about the run. We ran Toad's clean, had the usual difficulties in portaging Matterhorn, and fought our way down Pinball and Iron Box. The rafts had already run Haunted House and had set up safety for others, such as myself, on river left below the Room of Doom. It was pushy that day, but I was having a fine run and probably let down my guard a little. As I entered the drop, I must have been moving too slow. The river shoved me to the left and I fought against the current to stay off of the wall. I didn't quite make it, as my kayak got stuck in the Room of Doom. An eleven-foot Pirouette gets stuck easily in a long, straight hole and I was fighting hard to stay upright and get out. That's when the first photo was taken. The Room is "V" shaped. It pours over a rock wall, follows the river bottom, then comes up six feet away and heads back to the hole. A keeper, twenty feet long. A better description is one us kids used in the farm town where I grew up; it's like a canal's coffin drop. Everything is trying to go down and into the pourover. The only way out is the bottom and my large kayak wouldn't do that. So here I am fighting to stay upright in the Room of Doom. That didn't last long! I got rolled a few times and never could get upright again. Knowing that my guide friends were fifteen feet above me, I took one hand off of my paddle, put it on the bottom of my kayak, and opened my palm to the sky. Mike Olsen, river guide extraordaire, was ready. He dropped the throw rope INTO my open hand. I gave two quick tugs and he pulled me upright. I kept the rope in my hand. Mike then gave me slack and I tried to paddle out. I got sucked down again and rolled. Two more tugs later, Mike pulled me up again (see photo 2). I told him to pull me out, which he did, and I was finally clear. The owner of SRA later told me a fun little fact about the Room of Doom. 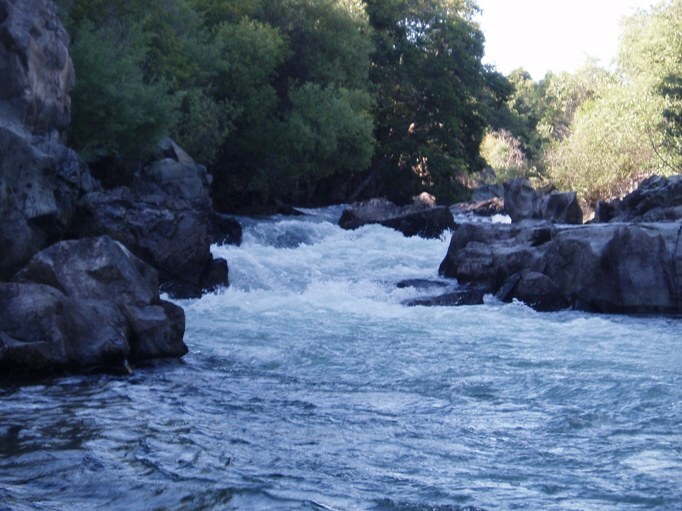 Even at that flow, you could probably stand up and walk out into the river and easily float away to safety. When I've been there at very low flows, I can see that it's bedrock, has no obstructions and is never more than a few feet deep. It can be a Room of Doom, but there is a way out. Minimum flow: 600 to 650. Anything lower and the lines close out. This level is the RAFT's min. Preferred: 900 to 1,250 cfs. Cleanest lines, most playspots, safest flows. Max (for me! ): 1,600. 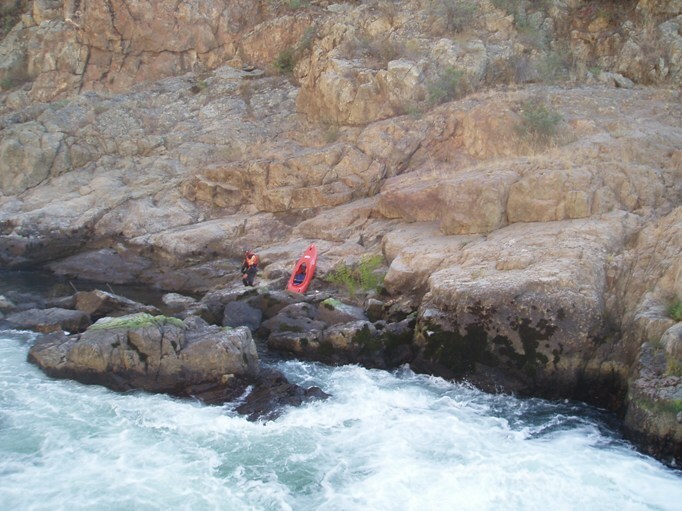 The canyon is so tight, that a 100 cfs difference can be easily seen. This is a VERY pushy flow. I've known guys who ran it at higher flows, but they'll never do it again. Mr. Toad's: Run right through the rocks until you get to Tombstone Rock (a dark, tombstone-shaped depression in the middle of a tilted rock. Then stay right over the three drops (large to small). Avoid the pour-over in the bottom center and the undercut wall on the right (difficult to miss both). At flows above 1,250, I've actually rolled to get under the undercut (it's on video). Pretty cool move, if you know it's clear. Freaks out the commercial raft customers, lol. Matterhorn: Best portaged left, unless you have a raft, then portage right. I've seen guys kayak it, but I wouldn't recommend it, as it will break your ribs, ankles, or whatever else hits Matterhorn Rock (you have the best photo of it I've ever seen). Pinball: Use the LARGE eddy on the right in the middle of the rapid. Even commercial rafts make this move. Haunted House: Your flow must have done weird things. At 125 cfs (went in to find my lost guide stick), it goes under the rocks in the drop and is impossible to run. Above 900 (I've not experienced anything in-between), you run straight down (feels like you're headed right) until halfway (rafts only) and then turn left and paddle for your life. Kayakers go left to right. 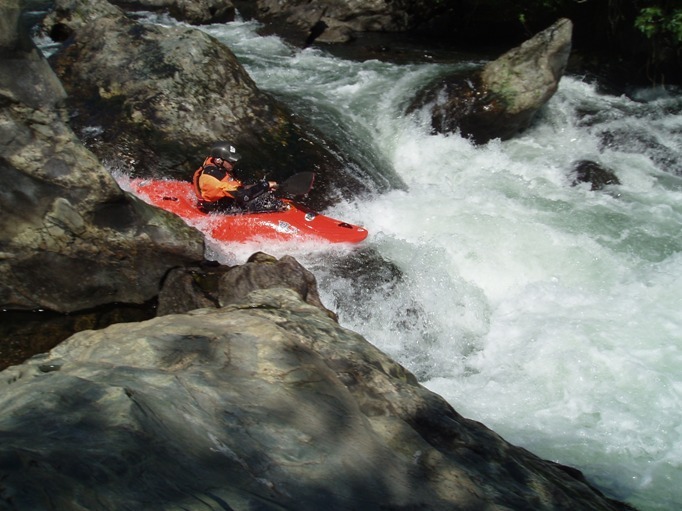 A rock on the bottom right takes out 1/3 of the flow and will flip any raft that stalls on it. I have video of a raft passenger breaking his teeth in there. I missed my raft move in there by one foot and spent 30 to 40 seconds underwater (according to my buddies). Kayaks have room for mistakes. Rafts do not. Next to the Room of Doom is the usual exit. This is an excellent ender spot for long kayaks. 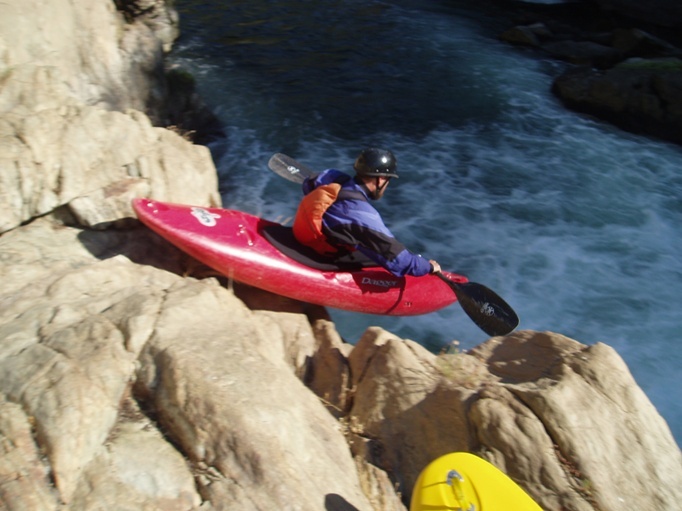 Rafters paddle up to the rock wall and jump into the pool for a swim out of the rapid. It's possible to be underwater for ten seconds at the right cfs. Trail out: Right bank thirty yards below HH. The road going up the hill leads to a canal and a trail that leads to Knight's Ferry. I'm 99% sure it's private. I've hiked up to here and kayaked down after playing at HH. 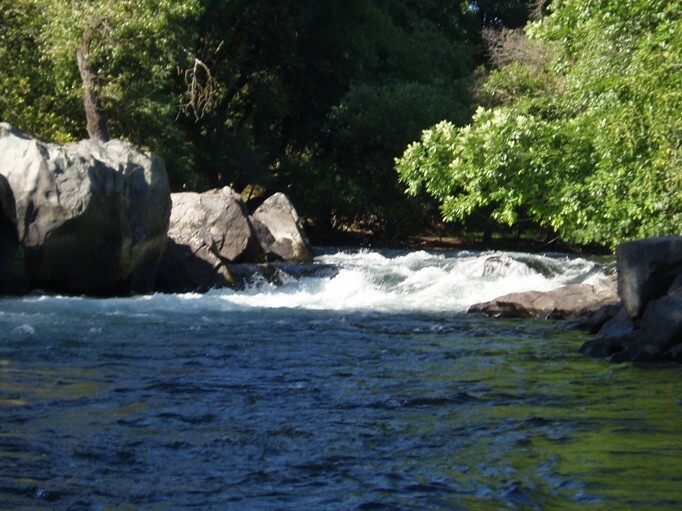 Air Mattress: Higher flows push you hard into the center rocks. Avoid them.